Private Jets And Private Matters On Tonight's Vanderpump Rules! Private Jets And Private Matters On Tonight’s Vanderpump Rules! 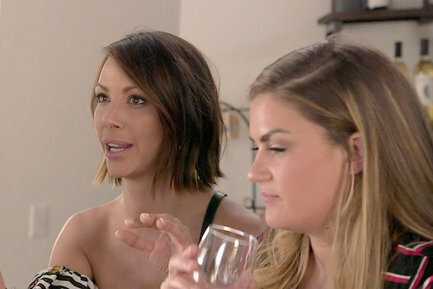 Tonight on Vanderpump Rules Lala Kent rewards the girls for no longer calling her a whore by taking them on a private jet to Solvang Wine Country. Of course, since this is Vanderpump Rules, aka NeverNeverLand for drunken delusionoids, Kristen Doute acts up and embarrasses everyone. Of course hinging your life’s worth on a private jet is embarrassing enough so I can’t imagine how bad Kristen must be! Meanwhile after a harrowing therapy experience where Brittany Cartwright wants him to discuss his cheating, Jax Taylor is thrilled to have an epic boy’s night while the girls are away. Unfortunately Tom 1 and Tom 2 have, like, responsibilities now, and are preoccupied with TomTom and Lisa Vanderpump‘s reality check that one successful client party does not a brilliant bar make. James Kennedy struggles with family issues when his mother reaches out to Lisa to ask about giving a job to one of James’ brothers – even though James hasn’t even earned his DJ gig back! This leads to James having an explosive argument with his mother over money. Sober James is suddenly reading all the writing on the wall about the ways his parents selfish behaviors failed their sons. You can chat about the episode as it airs in the comments, or check out Reality Tea’s twitter page! And make sure to stop back tomorrow morning for my Vanderpump Rules recap. TELL US – ARE YOU SURPRISED KRISTEN THROWS A FIT IN SOLVANG?